We can accurately identify your metabolic weaknesses through your genetic profile. This process is called Nutrigenomics and it is the cutting edge of truly personalized health care. 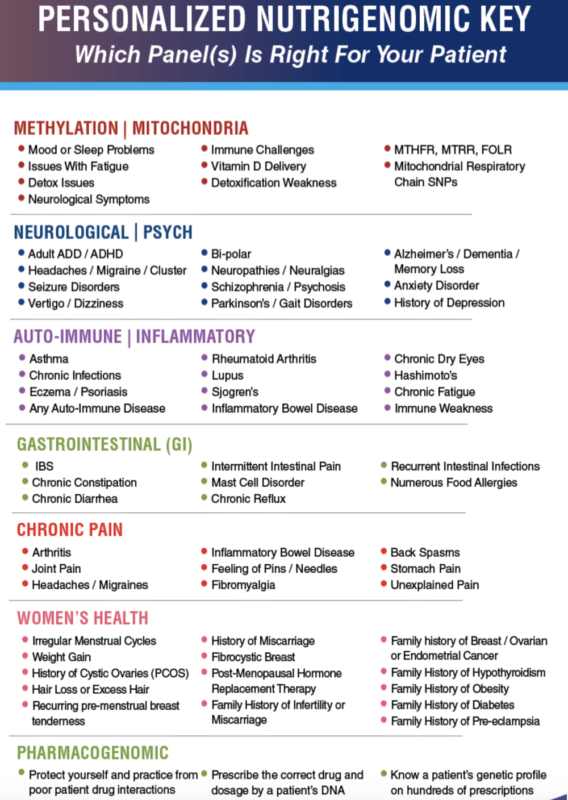 Having certain genetic mutations, called polymorphisms or SNP’s, can have a significant impact on your metabolic pathways, affecting how you absorb nutrients, how you process and use them, how you detoxify, how your immune system works, and if you are prone towards certain illness and disease. Having this information can help us better understand how your body works and may respond. For many who have already made dietary and lifestyle changes but have yet to find the outcomes they wish for, this can be a missing link of information. This is a ONE TIME TEST, your genes do not change, but you CAN change the way they express. Many genes act as on-off switches, you can keep those disease states that you are genetically prone to turned OFF by supporting your specific genetic profile and overall health. No matter your age this can make a dramatic impact on your quality of life and disease prevention. Which Panel Do I want? According to Genomix Nutrition "More than 75% of all patients have significant genetic variations (SNPs) in the most important nutritional metabolism pathways"